After Neil Sadler returns to his hometown following the tragic death of his wife, he is reunited with Mary Beeken, whose alcoholic husband brings her no end of misery. As a devastating event from the past bleeds into the present, Neil and Mary strive to resurrect hope for the future. 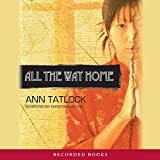 Christy Award-winner Ann Tatlock is hailed for her elegantly constructed tales and complex characterizations.